What’s it all been about and where is it going? Having lived in Northern Cyprus for a number of years it’s not surprising that I should develop an understanding and sympathy for the Turkish Cypriot plight and more so when you realise that their blood line goes back to the Ottomans who arrived here in 1571 from Turkey and ruled the island that remained part of the Ottoman Empire until it was ceded to Britain in 1878. During this period the Ottomans sent a sizeable Anatolian Turkish population to the island and some other nationalities who had also settled here on the island also adopted the muslim faith and became what would be considered to be “Turkish Cypriots”. So what has all the problems in Cyprus been about and when did it start and by who? During the Ottoman rule the first unrest started with many Greek Cypriots supporting the Greek independence effort that began in 1821 and this led to severe reprisals by the Ottoman Empire. When Greece became independent in 1829, many Greek Cypriots sought the incorporation of Cyprus into Greece, but it remained part of the Ottoman Empire. Following the First World War, Britain declared the complete annexation of Cyprus into the British Empire in 1914 as the Ottomans had aligned themselves with central powers in WW1. The colony of British Cyprus was proclaimed a decade later, in 1925. The United Kingdom granted the independence of Cyprus in 1959 following the Cyprus Emergency period of 1955 to 1959 which saw a terrorist campaign by the Greek Cypriot military group EOKA to remove the British from Cyprus so it could be unified with Greece. The process of independance started in 1959 when the United Kingdom granted independence of Cyprus with an agreement conference by both Cypriot community leaders with Britain, Turkey and Greece that declared the Republic of Cyprus on 16 August 1960 with Greek Cypriot Archbishop Makarios III being elected the first president of independent Cyprus with Turkish Cypriot Fazıl Küçük, the Vice President with extensive veto rights and in 1961 the Republic of Cyprus became the 99th member of the United Nations. With a revival of EOKA activities and renewed intercommunal fighting in 1963 the Turkish Cypriot officials of the Republic of Cyprus in protest at the changes being made to the constitution, withdrew from their state positions including the position of the Vice President. The United Nations Peacekeeping Force in Cyprus (UNFICYP) was established in Cyprus under United Nations Security Council Resolution 186 in 1964 to prevent a recurrence of fighting following intercommunal violence between the Greek Cypriots and Turkish Cypriots and to contribute to the maintenance and restoration of law and order. The Akritas plan click here was created in 1963 by the Greek Cypriot part of the Republic of Cyprus government with the ultimate aim of weakening the Turkish Cypriot (ethnic Turks living in the Eastern Mediterranean island of Cyprus) and then uniting Cyprus with Greece. The desired union of Greek Cypriots with Greece was referred to as Enosis……. Following the 1974 Greek Cypriot coup d’état supported and encouraged by Greece and the Turkish intervention in Cyprus as one of the 3 guarantor powers of Cyprus to prevent any further bloodshed, the United Nations Security Council (UNSC) extended and expanded the mission to prevent the dispute turning into war, and UNFICYP was redeployed to patrol the United Nations Buffer Zone in Cyprus and assist in the maintenance of the military status quo. Since its establishment, the force has also worked in concert with the Special Representative of the Secretary-General and representatives of the two communities to seek an amicable diplomatic solution to the Cyprus dispute. After eight years of failed negotiations with the leadership of the Greek Cypriot community, the Turkish Cypriots unilaterally declared its independence on 15 November 1983 under the name of the Turkish Republic of Northern Cyprus and this act was rejected by the UN and the Republic of Cyprus. So where are we now with yet another UN sponsored round of peace talks and their desire to make the Turkish and Greek Cypriots live together under one flag despite the enmity and lack of trust that has existed between them since 1821 when many Greek Cypriots supported the Greek independence effort. This time it seems, it’s a make or break meeting in Geneva to not just make peace but reunite the two communities as one nation which perhaps neither community want. The world news media pays very little attention to Cyprus and its problems and that of the Turkish Cypriots, so it was refreshing to find two video debates conducted by Francois Picard and hosted by France 24 as under. Please be patient and fast forward the video to the start of the France 24 debate on the Cyprus issue. This first video has given a number of commentators an opportunity to give their explanation of how the Cyprus problem had developed. The second video shows a number of commentators expressing their views of how the peace talks have progressed and what they consider the chances of a peaceful settlement of the Cyprus problem may be. So what’s it all been about and where is it going? Well, like so many previous attempts by the UN to get the two communities to agree to bury the hatchet and agree to live together, the talks have almost stalled. The UN understandably cannot admit failure and has announced that technical talks are to continue and a working group will be established in order to identify specific questions and the instruments needed to address them. The group will commence its work on 18 January. What I find puzzling that there is a lot of talk about exchange of land with land in the North being handed by the TRNC to the RoC and maps being exchanged by both sides showing what they will agree to which has caused an impasse and I would question what will happen to the land in the south which belongs to Turkish Cypriots like Larnaca airport for instance? 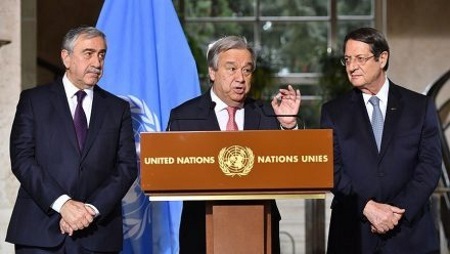 For a more overall view of the current progress of the Cyprus Peace talks please read the summaries by TRNC President Akinci, UN Secretary General Antonio Guterres, Turkish Foreign Minister Mevlüt Çavuşoğlu and the TRNC Presidential Spokesperson Barış Burcu in the article below. Following the completion of the first session of the 5-party Conference in Geneva with the participation of both sides and the guarantor countries, today the 13th January the UN made a statement on behalf of both parties. The UN emphasized that this historic opportunity to reach a solution in Cyprus should not be missed. The Conference on Cyprus was convened on 12 January 2017, in Geneva, under the auspices of the Secretary-General of the United Nations, with the participation of H.E. Mr. Mustafa Akıncı and H.E. Mr. Nikos Anastasiades, the Foreign Ministers of Greece, Turkey and the United Kingdom as guarantor powers and in the presence of the European Union as an observer. In the statement Mr. Anastasiades and Mr. Akıncı were praised for the remarkable progress made over the past 20 months in the Cyprus talks. It was noted that it was only possible to convene the conference yesterday due to leaders’ dedicated work. The statement added that all interested parties’ efforts will be necessary for the forthcoming period. Therefore, to this end, a working group will be established in order to identify specific questions and the instruments needed to address them. The group will commence its work on 18 January. The conference will continue at political level immediately thereafter to review the outcome of the working group’s discussion. To read more of this UN Statement please click here. This entry was posted in Information, News and tagged Cyprus dispute, Greece, Greek Cypriots, Turkey, Turkish Cypriots, UN peace talks, United Kingdom. Bookmark the permalink.